Model: TH-M505Enjoy a variety of video and audio formats in exhilarating surround sound with a 300W subwoofer for rich low-range sound. 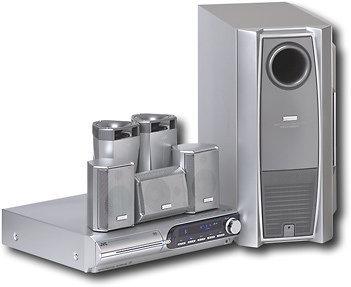 Complete home theater system includes 5.1-channel amplifier with built-in surround sound decoders, 5-disc progressive-scan DVD/CD/MP3 player, digital AM/FM tuner, 5 satellite speakers and active subwoofer. Progressive-scan video output maximizes DVD picture quality when used with a digital TV or monitor. Multiple 5.1-channel surround sound decoders built in.